In a Nutshell: Trello is an online platform designed to help individuals and companies stay organized. From projects to finances, Trello’s boards are completely customizable to suit a wide array of needs. With the use of cards and lists, the help of plug-ins, and app integration, Trello provides a turnkey solution that allows users to simplify processes by keeping tasks in one centralized location. Signing up is free, but the platform also offers Gold and Business Class upgrades at a nominal fee to enhance experiences. Whether running a business or just trying to structure bill payment dates, Trello sets a standard for organizational tools. Recently, one of my friends decided she was ready to take the plunge and turn her passion for consulting into a full-time career. She had been at it for a while, moonlighting by helping companies streamline processes, and her side income had overtaken what she was making at her day job. She was ready to branch out but knew it was going to be a huge transition. Working for so many years at a company with a large administrative team that took care of organizing finances for her, my friend quickly became aware that this was now going to be her responsibility. She was going to need a plan to track company expenses, keep up with tax documents, and organize her projects. As a consultant, she heard talk of an online organizational tool called Trello that gives users flexible and visual ways to manage tasks and finances and decided to put it to use. Trello allows users to set up boards to keep up with expenses and open invoices, track ongoing projects and deadlines with a productivity board, and upload receipts and scan W9s with a tax board. The best part of Trello is that all of this information can be accessed in one place. Like a digital filing cabinet combined with a financial ledger and invoicing system, Trello provided a solution for all of my friend’s finance and business needs. Trello is flexible in that it can be customized to work for businesses, personal tasks, finances, school or group projects, and pretty much anything that needs an organizational framework. Trello’s boards allow users to create tasks, checklists, add links to external sites, and upload documents.The platform uses large boards for categorization and then incorporates “lists and cards” for each board to narrow down the specifics. Create tasks, checklists, add links to external sites, and upload documents to organize your projects and finances. Users who are looking to, say, pay off a credit card within a certain time period can create a board where account information, such as balance, minimum payment amount, and interest rate, can be viewed in one space. With this information, users can employ Trello to set up a payment schedule and add action items, like making an extra payment every few months, to have the card paid off within the desired timeframe. Those looking to keep track of finances and get on track in a broader sense can use one of Trello’s board templates like the Financial Life Plan template, which features links to financial guru Dave Ramsey’s publications and includes checklists, ideas, and action plans to get started. The template can then be edited and customized to fit personal financial goals and needs. For businesses that operate in a team atmosphere, Trello provides a one-stop-shop for collaboration. Whether the team is working on a project together or managing a budget for the upcoming workshop, Trello gives businesses access to it all. Trello’s Business Class platform offers privacy controls and additional administrative tools designed to help businesses stay in control of their data and information. Trello Business Class also automatically upgrades each user to Trello Gold. Customer support is of utmost importance at Trello, and Business Class gives the entire team priority customer support through direct email. Fender Musical Instruments Corporation was recently featured on Forbes, showing how versatile Trello can be. Fender employees are using Trello Business to plan trips, post board meeting agendas, share news articles, and track job candidates through interviews. Trello allows business teams the ability to collaborate wherever they are. Trello also has integration capabilities so teams can include other apps and features they have already been working with. For example, if teams are working with chat services, they can be integrated into Trello so team members can stay in touch in one space. The platform also integrates with Evernote, Google Calendar, Twitter, and much more. This keeps everyone working under the same roof and creates greater team efficiency. Trello’s “Power-Up” feature allows teams to customize their experience. The Salesforce Power-Up gives sales teams the ability to organize leads, maintain contact information, and keep details about cases together on one viewable platform. Keeping track of finances can be a bit cumbersome for consumers and businesses alike. For consumers, staying on top of debts, income, loans, and investments could mean logging into multiple accounts, making it easy to miss something. For businesses, having multiple systems for invoices, past-dues, project budgets, and payroll can make an accountant’s job more complicated. Trello solves these financial issues for consumers and businesses with its customizable platform and Power-Up options. The platform’s Portability app makes it easy to calculate financial information on the go. This means employees can track expenses in real-time, and consumers can stay on top of their budgets so not to overspend. The Calendar Power-Up feature shows due dates and invoice dates in an easy-to-read calendar format so you won’t have to worry about missing a payment or forgetting to cut a check for an invoice. Trello’s Calendar Power-Up is a great tool to ensure invoices are cleared and payments are made on time. Trello also allows you to set up customized notifications sent directly to your email, so you can set up reminders when payments are due. Likewise, businesses can set up notifications for team members to turn in expense reports. Another great feature Trello offers is the ability to filter and label information. This way, you can keep track of your investments and bank statements through filters, all the while keeping the information in one secured location for easy access. In a business setting, managers can give access to multiple people so that a group working on an upcoming project can scan in receipts, submit expense reports, and keep track of their budgets. Notifications can be set up so that a manager is notified when something is added, helping to keep information current. The platform’s comment feature makes it easy to notify a team member if something is missing or needed. Comments are sent directly to the designated person’s email should any problems arise, allowing them to be solved quickly and efficiently. 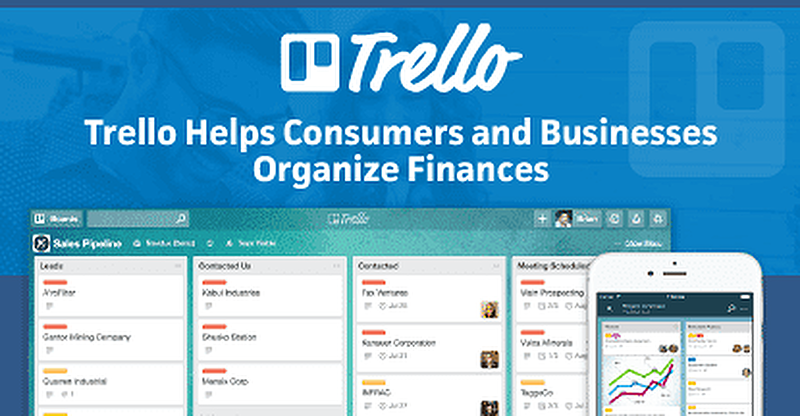 Trello provides simple solutions to some of consumers’ and businesses’ most complex organizational issues. Whether keeping track of an extensive project budget with multiple team members or simply wanting to pay off debt, Trello provides a visual, easy-to-use platform. Trello Gold takes this user-friendly platform one step further, offering users the ability to upload larger files — 250 MB rather than the standard 10MB. Customized board backgrounds and extra stickers also add a little personality. Trello helped my friend get her business on track, and she’s been at it for almost a year now. To this day, she attributes much of her success to Trello’s organizational assist.